Shabbychick Junk. : Our Craft Lounge - Doctor Peanut! Here's another sneak peek for you, from the brand-spankin-new stamp company called "Our Craft Lounge"! (FRIDAY, FRIDAY FRIDAY, GIRLS!) Hmmm..I'm sensing a theme this week in my stamping...STILL SICK here in Minnesota! I've got drugs now, so life is good. Doctor Peanut prescribed antibiotics! YIPPIE! 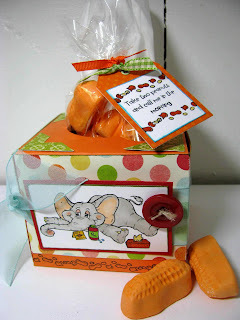 Here's a little get-well gift set I concocted, using the 'peanut' theme, with orange circus peanuts inside. 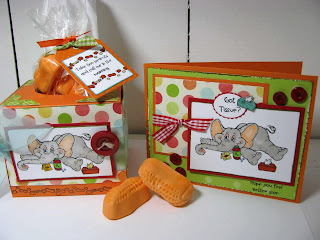 I made a matchy-matchy kleenex-y gift box and card with our cute little sick ellie! I have to tell you about how this little gift set came about because you'll get a laugh outta this one. I was gifted a ton of cute boxes from Terri at Creative Cuts and More, to congratulate me for being chosen to the Splitcoast Dirty Dozen! Terry sells individual cuts of the Accucut die cut boxes, in any color you want! So in the goodie bag she sent me an Accucut cupcake box. I pulled the box out of the package in pieces, and looked at the box and thought, cool, they have KLEENEX boxes now! So I brought the box along with me on Saturday, and used my killer red tacky tape to adhere the kleenex-y piece to the top of the box, and then decorated the box with my little ellie image! SEE, it looks like a KLEENEX BOX, RIGHT? RIGHT?!!! 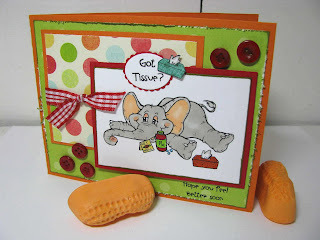 There are MORE MORE MORE sneak peeks of the OCL (Our Craft Lounge) stamp sets and yummy eye candy on the following blogs! ENJOY! OMG!! Stinkin' cute LZ, love the peanut candies you used. My dad use to love those! OMG! Z, you crack me up! I love how you always think outside "the box". What a GREAT idea. I looooooooooove this!!!!! LISA!! OMG, you are ONE AMAZING, MIND BLOWING STAMPER!!! Where do you come up with all this stuff? I want to come and hang out with you and have some of it rub off on me! Lisa, you never cease to AMAZE me!! I think you are the most imaginative stamper I have EVER met! 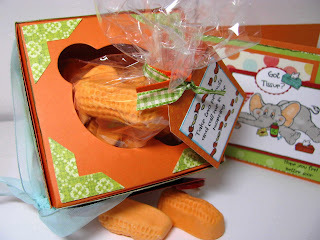 Those stinkin circus peanut are gross but I LOVE the idea! Can't wait to get my hands on some of those stamps! See you Saturday! I love the peanut candies.....HOW fun to eat. They are a perfect match for the DR. Peanut cards. I am laughing over how you creatively made the kleenex box. BAWHAHAHAHHAHAH Lisa!!! Too stinkin' cute. Love the set... can't wait to get it!! LOL! I'm still laughing over this! 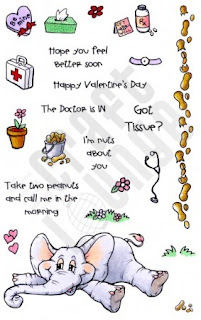 Of course, you are the ONLY one I know that can turn a silly mistake into something waaaay cute! THis is really cute Lisa! IT DOES look a lot like a Kleenex box! But better than tissues!!! OMG!!! This is sooooo cute!! and I loved your Creative Cuts & More story - kleenex box - woulda never thought or had that creativity!! too fun!!! I can't believe it! The first thing I thought when seeing this set was to use circus peanuts too. My son is sick and he loves circus peanuts. What a cute set! Even if you didn't do it as intended, it turned out awesome!